A vast majority of marketers are using content marketing today. Content marketing is used by top organizations in the world that includes P&G, Microsoft, Cisco Systems, and John Deere. Small businesses around the globe also rely on content marketing, because this type of marketing works. An organization uses content marketing for three reasons that are: increased sales, cost savings, and more loyal customers. What Differentiates Content Marketing from Other Forms of Marketing? Relevancy and value are the terms that different content marketing from other forms of marketing. Companies often send us information that is not relevant or valuable for us most of the time, hence you say: That’s spam. However, content marketing is not spam information. Today, companies rely on content marketing, because they know content marketing works best for businesses. 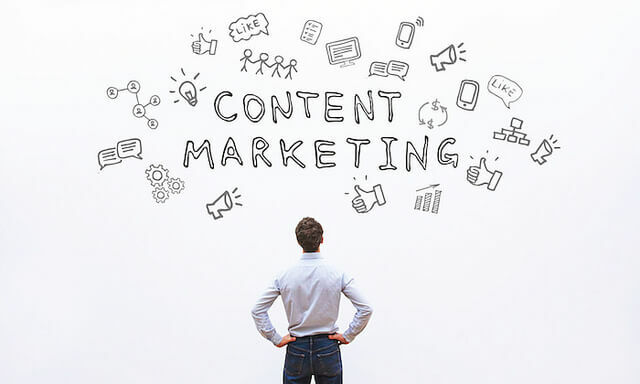 Effective content marketing strategy is built on two pillars that are: A set of robust, strategic buyer personas (semi-fictional representation of the customers) and understanding of typical buyer’s journey (active research process that customer goes through to buy a particular product). Content marketing strategy analyzes the different ways content marketing can be used across the buyer journey, the customer lifecycle (progression steps that customer go through while considering, purchasing, using, and maintaining loyalty to a product or service), and different customer touch points (encounters that alter the way customer feels about a product or service). Social Media: Social media is one of the most used channels for content marketing. There are 3 billion users around the world who use social media, this content marketing through social media is very popular. The most popular sites for marketing content on the social media are Facebook, Twitter, Instagram, Snap chat, Pinterest, and LinkedIn. Email: 93% of the users who use email consider email an important channel for their content marketing success. Hence, email is a popular way to market content. Content marketers create the emails in the way subscribers want their emails to open, thus content marketing through email is not a spam and it works. Call to Actions (CTAs): Effective CTAs also work for content marketing. Interesting and captivating CTA attract customers and force them to take quick actions. CTA is a very popular channel for content marketing, and count for making the content effective. Blogs: Blog is another popular channel for content marketing. Blogging is a regular activity of bloggers over the internet, and it attracts readers from around the world. Blogging is a unique way to promote content; therefore, many bloggers in the world rely on their blogs to promote pieces of content that they create. EBooks: Another popular way to market content is through eBooks. EBooks have detailed content and get the attention of the readers easily. EBooks are both paid and free, hence get attention to all types of readers. Literally speaking, eBook is a content marketing tool that really works. Videos: Content marketing through videos is also common today. Promoting content through videos is popular because 88% of average users spend more time on a website with video. 70% of B2B buyers watch videos to purchase a product or service. 64% of video viewers more likely buy a product or service than non-viewers. These facts indicate content marketing through video is very effective. The purpose of content marketing is to get the right information to the right audience at the right time. Customers spend more time on research before buying anything online, and it is a piece of content that helps customers decide to buy a particular product or a service, hence the importance of content marketing be ignored. Effective content is memorable, hence it should be marketed properly by business owners. You should use clear and concise sentences if you want to get readers’ attention. Your tone of voice in pieces of content should be consistent. You should prioritize SEO if you want to come up with the standout content. Storytelling is a technique that you should use for describing your content. Your content should have a presence on social media. Visuals attract customers and work well for content marketing. You should know the strategy of your competitors if you want to create content that competes with your competitor’s content. Your content should indicate that you listen to your customers. You should revisit the old content and make changes to it whenever necessary in a timely manner. You will have to wait for some time to get the attention of the target audience with your created content. In short, content marketing is a modern form of marketing, and it is slowly replacing traditional marketing. Majority of marketers nowadays use content marketing. Relevancy and value are the key terms that distinguish content marketing from all sorts of marketing. Marketing has no meaning without the great content. Content marketing channels are the tools to promote content. Everything should be right is the purpose of content marketing. Some of the most favorite content marketing quotes that will inspire you. “Make the customer the hero of your story.” – Ann Handley, Cheif Content Officer at MarketingProfs. “Traditional marketing is telling the world you’re a rock star. Content marketing is showing the world that you are one.” – Robert Rose, Senior Analyst at Digital Clarity group. “Content is king, but marketing is queen, and runs the household. – Gary Vaynerchuck, CEO, Vaynermedia. “Content is the atomic particle of all Digital Marketing.” – Rebecca Lieb, Analyst, Advisor, Author and Board member. Alvina Amanda is a professional content writer. She is an MBA in Marketing, and he has knowledge of the principles of business. She works in a Write My EZ Assignment Cheap where he creates Assignment-based articles and blog posts. Prev10 Tricks That Will Make Your Skin Glow! NextHow to Search for the Best Android App Development Company in USA?